Emotion Kräcker herbal small rodents, with thyme and nettle contains the Triviat complex, the innovative extra for an excited and healthy rodent life. 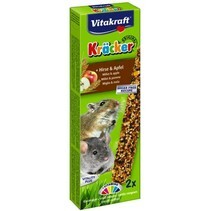 The Kräckers are tailored to the nutritional needs of the small rodent and are a valuable addition to the Emotion main food. The Kräckers are triple-fried on nibble wood, for an activity that suits the animal species and extra long nibble fun. With herbs and valuable vitamins and prepared according to a sugar-free recipe. Developed by veterinarians and rodent experts. Make sure that there is always a Kräcker in the cage or loft. Keep cool and dry. De enige snoepstengel die mijn dwerghamster lekker vindt!